Through the Department of Industry, Innovation and Sciences’ (DIIS) Innovation Connections Programme, contentgroup has been working with the Australian National University (ANU) in a two-stage collaboration to develop, refine and validate the evidence base to underpin our content communication methodology, framework and accompanying toolkits for use in government and the public sector. In the first stage, the research partnership has developed a standardised framework to communication planning that governments and public-sector organisations at municipal, state, national and multi-lateral level can use anywhere in the world. The framework combines best practice in strategic communication and project management informed by both theory and relevant practice. It is driven by audience needs and aligned with business objectives. Using robust measurement and evaluation principles, the framework provides government and public-sector organisations with an evidence-based approach to consistently communicate policies, programs and services to their citizens and stakeholders. In the second stage of the research project, the ANU research team and contentgroup continue to refine the fundamental concepts of the methodology to ensure it can respond to the changing political/technology landscape and citizens’ shifting preferences. The second part of the research further aims to involve public sector domestically and internationally to collaborate on further improvements to the evidence-based approach. 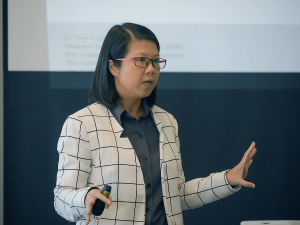 David Pembroke speaks to Dr Ying-Yi Chih, lead researcher on the contentgroup-ANU content communication project, about the exciting work she and her team are doing. The National Innovation and Science Agenda identifies the problem that small businesses and their engagement with university is a very weak part of the Australian innovation system. contentgroup was fortunate enough to apply for and receive an Innovations Connections Funding. We are now using this grant to bolster our content communications methodology with evidence-based research and specially designed toolkits. As part of this, Dr Ying-Yi Chih and her team have engaged with more than 20 governments from local, state, federal and multilateral levels, to test, validate and feedback on the contentgroup approach. Amitesh Kumar is a research associate on the Content Communication research project – a collaboration between the Australian National University and contentgroup. Amitesh describes his role in this project, and how he will bring theoretical underpinnings and knowledge into practice. Nicolas Riquelme describes the process that informs the content communication research project – a collaboration between the Australian National University and contentgroup. Nicolas is a research associate on this world-first project.